BBC TV interviewed a professor from London University who had perfected a technology he called "smellovision." 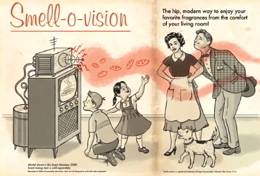 It allowed viewers to smell aromas produced in the television studio in their homes. The professor explained that his machine broke scents down into their component molecules which could then be transmitted through the screen. The professor offered a demonstration by placing first some coffee beans and then onions into the smellovision machine. He asked viewers to report by noon whether they were able to smell anything, instructing them that "for best results stand six feet away from your set and sniff." Viewers called in from across the country to confirm that they distinctly experienced these scents as if they were there in the studio with him. Some claimed the onions made their eyes water. The Smellovision experiment was repeated on June 12, 1977 by Bristol University psychology lecturer Michael O'Mahony, who was interested in exploring the effect of the power of suggestion on smell. O'Mahony told viewers of Reports Extra, a late-night news show that aired in the Manchester region, that a new technology called Ramen spectroscopy would allow the station to transmit smells over the airwaves. He told them he was going to transmit "a pleasant country smell, not manure" over their TV sets, and he asked people to report what they smelled. Within the next 24 hours the station received 172 responses. The highest number came from people who reported smelling hay or grass. Others reported their living rooms filling with the scent of flowers, lavender, apple blossom, fruits, potatoes, and even homemade bread. Two people complained that the transmission brought on a severe bout of hay fever.